Get everything you need to make this project in the click of a button! If you have never made cold process soap before, I strongly suggest getting a couple of basic recipes under your belt before diving in. 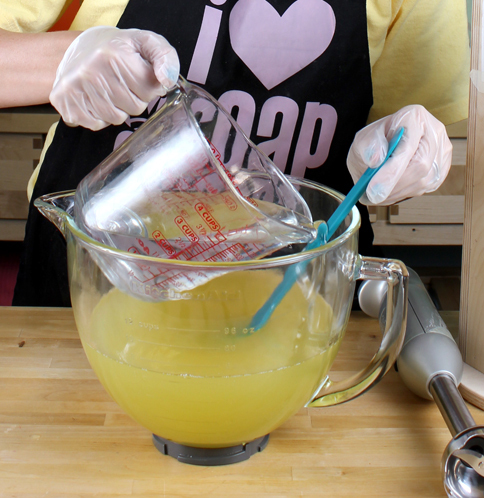 Check out Soap Queen TV on Cold Process if you want to get started with cold process. It’s a 4 part series that will take you through the basics (and be sure to watch the episode on Lye Safety). If you’re a book worm, Bramble Berry also has some helpful reading on the cold process technique. Also, I was lax and am wearing a short sleeve shirt in these photos. You should do as I say, not as I do, and wear a long sleeved shirt when soaping. PREP: Line your Vertical Mold with freezer paper (shiny side up). While you can use your Vertical Mold unlined, we like the extra snugness that the freezer paper gives the plastic liners. ONE: Carefully add your lye to your water (never the other way around!). Slowly mix until the water is clear. Set aside to cool. TWO: Melt and mix the Canola Oil, Castor Oil, Cocoa Butter Oil, Coconut Oil, Olive Oil, Palm Oil, and Palm Kernel Flakes. Add the Avocado Butter to the heated oils mixture, stirring so that it melts slowly and doesn’t get grainy. THREE: Slowly add the lye water to the oils and butter mix and stick blend for about 10-15 seconds until you reach a light trace. FOUR: Split the batch in half. Totally fine to eyeball this step. FIVE: Fragrance both batches. Because I was counting on the discoloration for one of my “colors”, I added a bit more Sandalwood Vanilla in one batch than the other. The more heavily fragranced batch might accelerate trace a bit, so I mixed it in with a whisk. Set the heavily-fragranced soap aside. 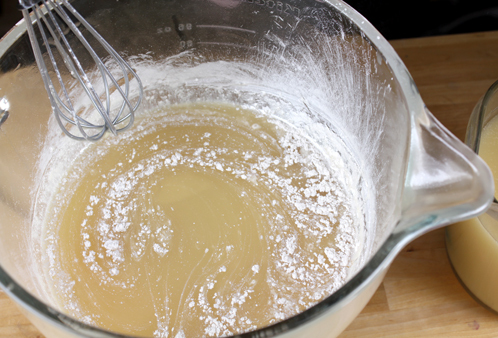 SIX: Add the Super Pearly White mica to the batch with less fragrance and mix in well with a whisk. SEVEN: Pour one batch into either side of the mold. Now for the twist! To remove the divider and add the circle design. Gently pop-up the center divider just enough to unhook it from the bottom mold liner. Turn it around 180 degrees in one smooth motion. Then lift the divider up and out completely, trying to keep it straight and centered. Ta da! 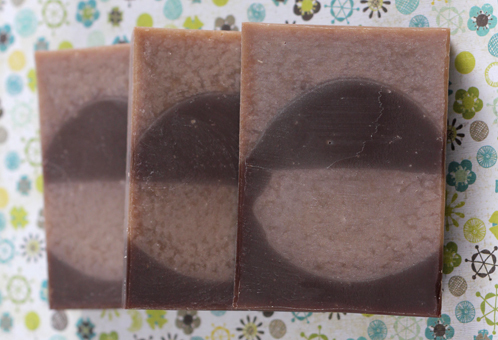 The outcome will be a really cool effect in your soap once you cut it. 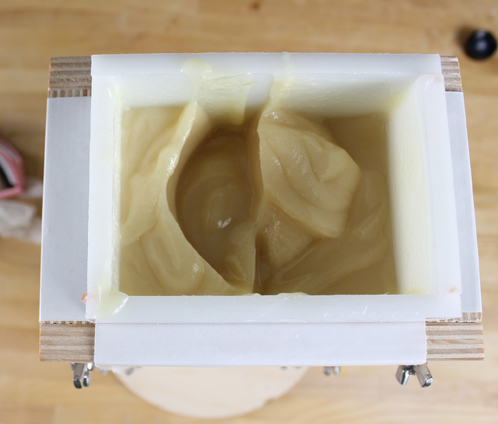 EIGHT: Let the soap sit in the mold for 24-48 hours, then unmold and cut the soap. You may have noticed that it hasn’t discolored all that much as it sat in the mold. Not to worry! The discoloration will take place over a few days. I took pictures of my soap’s discoloration over 5 days in a row, and then after it sat over a long weekend. It’s amazing to see the progression! Check it out! Previous Post: Let’s Swap Some Bath Bombs! If it’s a traditional 4 ounce bar, this will make around 18 bars. You just take the total ounce yield (73) and divide by the size bar you want (4) and that gets you the approximate number of bars that you’ll get. This is really cool! And I love sandalwood scent. I wonder if you would consider including a few more recipes that don’t use palm oil. I am trying to avoid it for the environmental impact, but don’t want to make only castille soap. Thanks again for this fun recipe! Love this soap! What a creative idea! I can’t get over the huge color transition! Thank you for sharing! Gorgeous, and what a cool theme — to turn something most consider negative into a positive. Even better when you are wearing super cool pink Goggles 🙂 Great job! Wow, those look fantastic! Such a neat technique and a great way to use discoloration to your advantage. I love the pictures of the color changes! Very cool soap. Looks so cool! Is it best to wait until the soap sets up to thick trace before doing the twist? I’d make sure you were at a medium trace to ensure that the design stayed crisp.